Here are some of my suggestions on choosing gear for the PCT. More ability to be relaxed and engaged with your surroundings. Be sure to do overnight trips before you get on trail and put all the gear to the test that you plan on using. 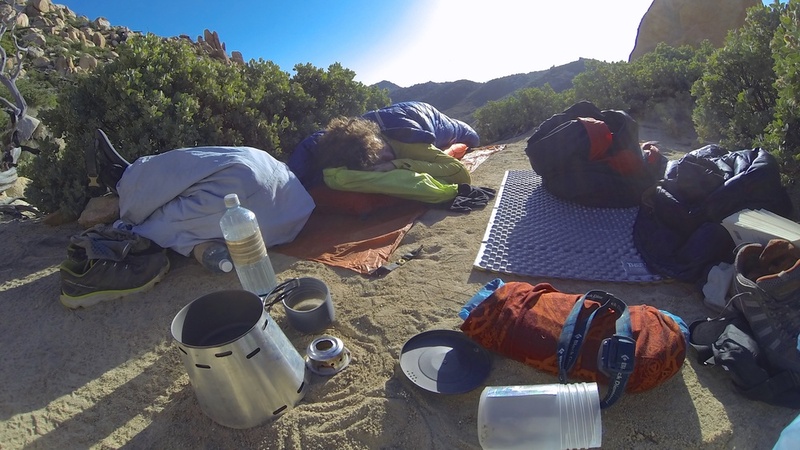 Our gear spread out after a night under the stars in Southern California. Buying Gear: Many realize late into their hike that they want to go lighter. Do your research, plan ahead and avoid replacing your gear later in the hike. Focus carefully selecting the “big 3” (shelter, sleeping bag, backpack), the three heaviest and most expensive items you will carry. Footwear: Many folks are surprised to realize that almost all thru-hikers wear trail running shoes rather than hiking boots. Running shoes are preferable as they are breathable and dry quicker than leather or Gore-Tex. The Pacific Crest Trail is a gentle walking path free of rocks along most of it’s length and with a light pack load little ankle support is necessary. Expect to wear your shoes out every 450 miles – most hikers replace their shoes 4 times along during the journey.